The novel is also notable for being narrated by a woman, Helena, now ninety years old and remembering her youth. For this reason much of it takes place away from the fighting, and yet Mortier manages to movingly convey the effects of the war on both place and person. The novel ends with the war and Helena’s return to her home and her father, who has been separated from them throughout. Mortier demonstrates the effects of the war on occupied Belgium simply though the difference in her home: the house “cleaned out”; the vegetable beds in the garden. 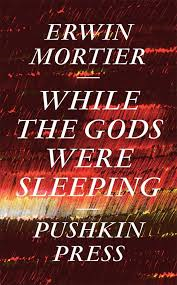 How well readers get on with While the Gods were Sleeping will very much depend on how they take to Mortier’s discursive / rambling (delete as applicable) style. I often felt I was having to work quite hard to dig down to the best of the writing, however, there were moments of lyrical beauty amid the cacophony of wordiness that kept me reading. You are currently browsing the archives for the Erwin Mortier category.